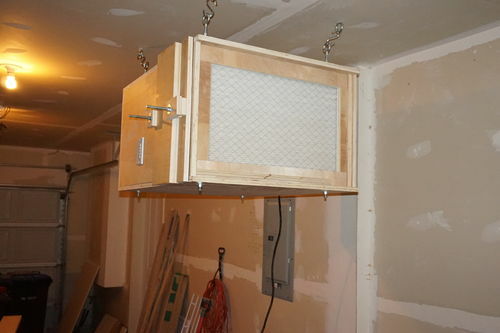 A popular home-built shop accessory these days is a filtered shop air cleaner, of which I’ve had the privilege to see several designs. 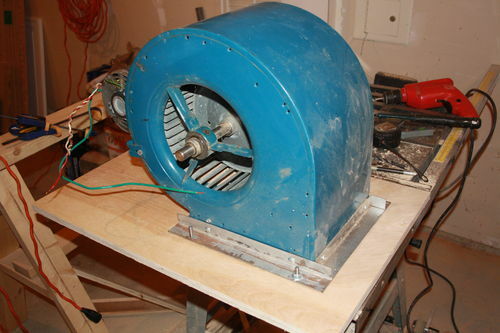 Whether floor standing or ceiling mounted, or using box fans or centrifugal blowers, they all have some things in common: they are fairly simple and inexpensive to build. My workshop is located in a tandem two-car garage, in rainy Vancouver, BC, Canada, thus it is not always feasible to leave my garage door open for long lengths of time (woodworking is also a hobby to me, so I often only get shorter spans of time to actually do work) so I wanted something to circulate and filter the air. I could buy a shop air cleaner, but the minimum price tag on such a device runs at about $300 (CAD, as will be any other prices listed below) – and that’s with a filter ineffective at trapping fine < 1 um particles. 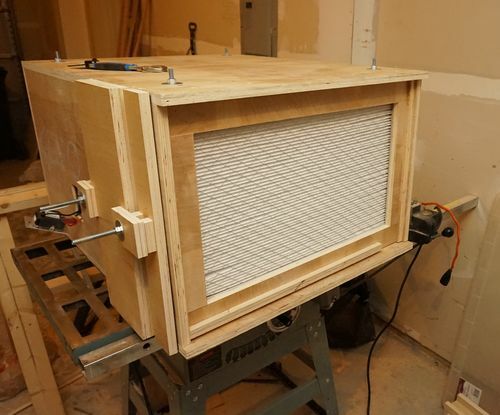 I knew I could do better, as many others have before me, so here’s my entry into the long list of shop-built air cleaners. 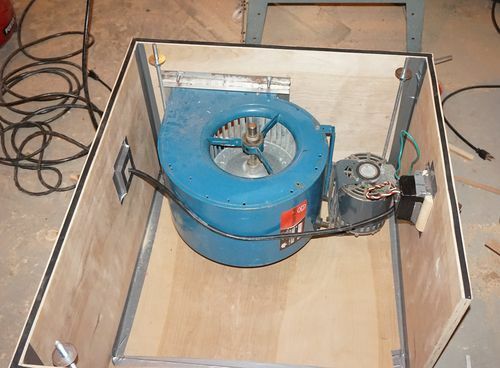 This project began with the purchase of an old furnace blower off of Craigslist for $25. I used the photographs I took (shown below) along with a couple of quick measurements into Matthias Wandel’s Big Print. 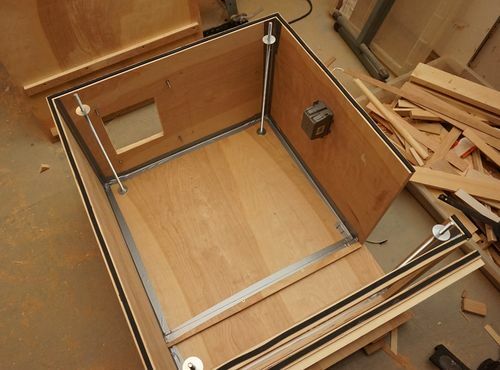 I used Big Print to gather further dimensions so I could model an appropriately sized enclosure in SketchUp, after which I proceeded to purchase a single sheet of 3/4” shop grade birch plywood (which I found would suffice for the entire build) and some additional hardware. I also purchased an AprilAire 413 (4”; MERV 13) whole house filter from Amazon. I believe MERV 13 is the lowest that claims to have any effectiveness for filtering sub-micron particles (Clear Vue uses a MERV 15 filter I believe), though they don’t give a guaranteed percentage. Because the Aprilaire filter media is designed to work with their proprietary cartridge (which I had no intention of buying), I had to figure out a different way to mount it. As shown below, I epoxied two rabbeted pieces of plywood to the top and bottom. 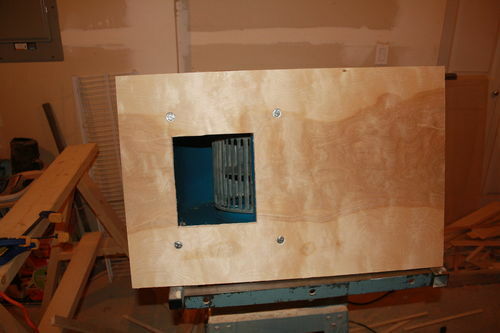 The extended plywood edges will slide into a set of rabbeted cleats in the enclosure. When I replace the filter, I will need to make new cleats, but I’m not concerned with that (I’m hoping to get > 1 year life out of the filter). 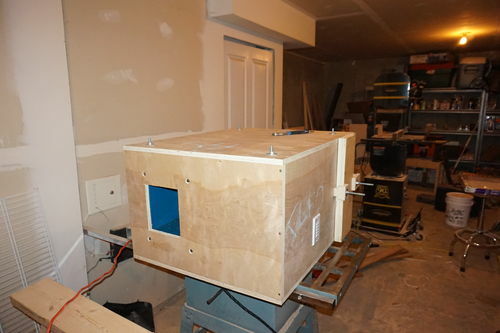 The enclosure is a simple box with some holes here and there, and a few other doodads. I began by fixing some threaded rod to the bottom panel as shown here. The rod is mounted using large washers and nuts both above and below the sheet to hold it in place. I will fasten the top likewise. Ultimately, to the threaded rod will be connected some eye bolts from which the device will hang from the ceiling. If I were to only fasten the hooks to the top piece, the weight would be borne by the 1-1/4” construction screws holding the box together. While that may suffice, I wanted more, so this method of mounting a length of threaded rod through the entire device should provide more security. 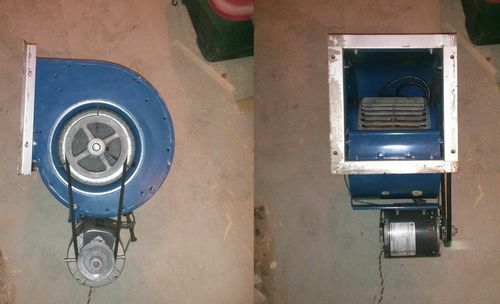 Next, I cut the mounting and outlet holes for the blower and gave it a test fit as shown here. In some cases, it may be necessary to adjust the size of the hole, but more on that later. I then proceeded to fit all the box sides together, yielding most of the assembly as shown. You can also see where I cut a hole to mount the switch box. I applied duct tape to the inside edges to seal the interior, and applied weather stripping to the top edges – well, the bottom edges, the unit is upside-down right now. 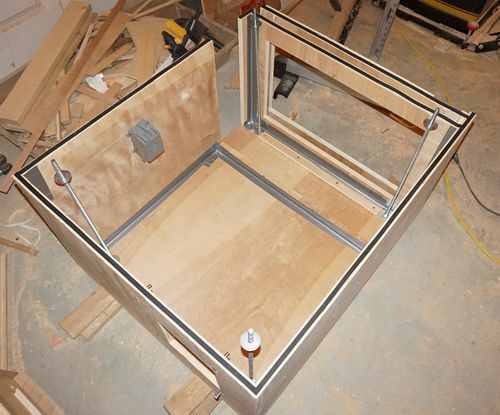 The reason for the weather stripping on this side is that I didn’t use wood screws to secure the bottom panel (only the threaded rod and nuts hold it in place) in order to facilitate easy access to the interior if needed. You may have noticed some frames in the back of the unit, these are pieces of plywood joined through crude half-lap joinery cut on a bandsaw. 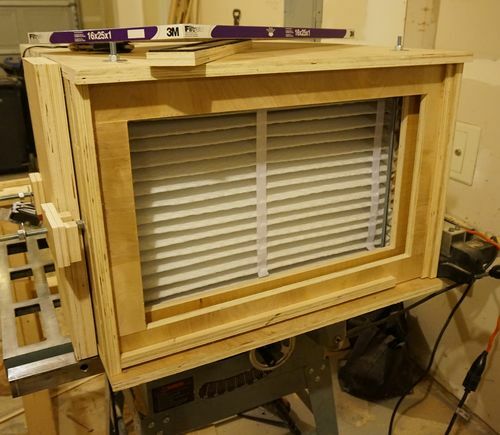 The purpose of these frames is to create slots for two pre-filters. Right now, I’ve only made allowance for one pre-filter, but there is definitely room to add another if I wish (haven’t decided yet). In this next photo, you can see that I have the blower installed and the switch wired up. Wiring the switch was definitely a pain, but worked out in then end. 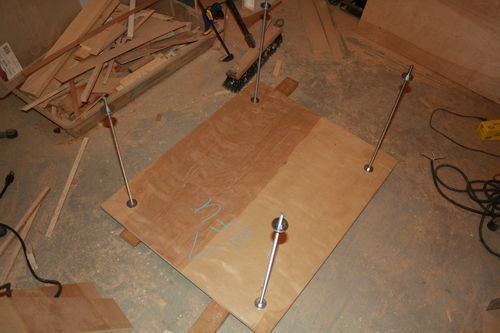 After installing the bottom panel, I finally, with much difficulty, managed to prop the unit up atop my table saw to start testing the unit (I unwisely turned it on while on the floor pointed at a pile of sawdust – I’ll let you guess what happened then). Below are some photos of the unit showing the front and the rear (one with just the Aprilaire filter and one with the added 3M filtrete pre-filter; $10). I realized earlier that I actually made a mistake with the box dimensions: it is 3/4” too narrow for the width of the Aprilaire filter. To work around this, I made a shallow box-like cover for the hole where the filter gets slid into the box. The filtrete filter is narrower, so I just needed a flat piece of plywood. Both covers use weather stripping to seal, and are held on by two very roughly made clamps as shown in the next photo. The two extra-long carriage bolts were lying around in my shop. I bought them a long time ago for an as-yet unrealized purpose. I will either swap them out for shorter ones or cut them down to size later. I also plan to use a star-knob instead of just nuts. So it turns out that a furnace blower is designed to work against a back pressure, which needs to be tuned by observing the amp draw of the motor while adjusting the front opening (I have a clamp-style DMM to facilitate this, but a plug-in power meter would also work). The bare blower was drawing something like 12 A despite the motor being rated for 6.5 A, meaning it would probably burn out quite prematurely. Fortunately, with the enclosure and filters installed and no additional changes, the unit draws about 6.4 A after running for a minute or two so I think I should be good. Being done with the electrical, I mounted the switch and switch plate. I installed a timer switch, as I plan to leave the unit running for maybe an hour after leaving the shop. While this switch looks to only go to 60 min, the manual seems to suggest it can be programmed to time up to 12 hours if ever I feel like I need more. So below you can see my crazy scheme for hanging this thing. 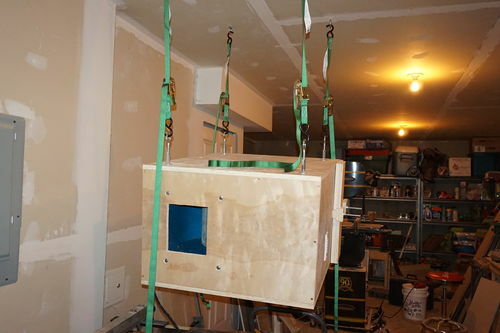 I have four ratchet straps holding the unit up in the following photo. This worked getting the unit maybe a foot below the ceiling, but I wanted it higher (my ceiling is only 8 feet high, and this unit is about 1.5 feet in height, so ideally I wanted the bottom 6 feet from the ground, so I could safely walk without hitting my head on it). 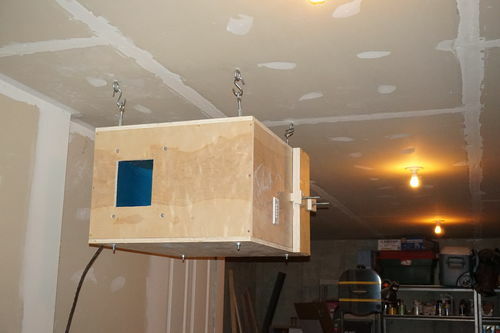 With much pain and many sketchy ideas involving the ratchet straps and aircraft cable, I did manage to get the thing suspended from the ceiling via eye screws and S-hooks. So the project is basically done in one blog post, so why did I make a series for it? 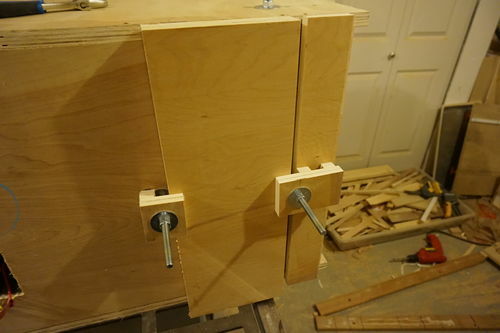 Well I “plan” to make some improvements in the future, such as finessing the clamps holding the side panels on, maybe finishing with a bit of trim and possibly painting or finishing it nicely. If I ever get around to these things, I will write a part 2 for this series. But don’t wait up! It could be a long wait, if I ever do get around to it. I’m also not planning on adding this as a completed project, since for now I want to keep it for my woodworking projects that come out of my shop, rather than the ones that stay in. Having turned the unit on for a while, nothing untoward happened, and the filter remained quite white. So I did some sanding with a ROS around where the intake would be. I didn’t hook up a vacuum to the sander because I wanted to see how well the unit dealt with the dust. While I don’t have any instrument such as a Dylos particle counter to actually do a reasonable test, I did notice that the pre-filter was noticeably more “sawdust-coloured” afterward, so clearly it is catching a significant amount of airborne dust. I know that not much new has happened here, many have made such a system already and wrote about it, but I hope that you still enjoyed reading about my take on it, and if there was something helpful to you here, then I’m all the more glad I shared. Great project and write up!!! A little left over stain would make that birch ply look great but that’s me, I’m not much on paint. Thanks! htl, I know what you mean about paint – I don’t enjoy applying it and typically prefer natural wood. My reasoning was to paint it mostly white to try and keep my shop bright looking. If I ever muster up the will power, I might one day actually paint the walls in my shop which would help as well. I like the timer idea! 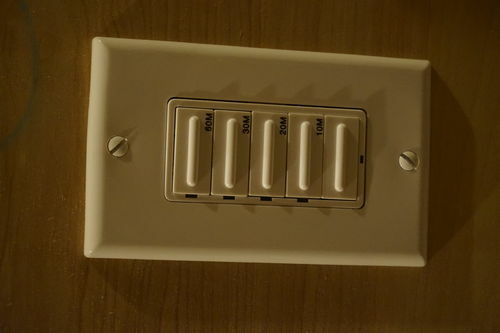 I believe the time switch you used is a Leviton model, can you tell me the model number as there are so many varients? Yes, it is a Leviton Decora LTB60-742 (based on the product listing on Home Depot’s website). I simply went to Home Depot and selected the switch with the longest timer I could find (in this case, 60 min, they have other options as well). Here is a link (note that it’s for Canadian Home Depot). I just now Looked through the couple of reviews while I was on the page, a few have commented that after about 2 years it starts to make an electronic buzzing sound. I guess I’ll see if that becomes an issue for me, but I guess do a bit of research before buying if this is a concern. One other point I was a bit disappointed with was the lack of any “always on” button; you need to wire it to a separate on/off switch for that. Not too big of a problem, I can just keep pressing the 60 min button every time it shuts off.